THE STORY - Recently deceased, a white-sheeted ghost returns to his suburban home to console his bereft wife, only to find that in his spectral state, he has become unstuck in time, forced to watch passively as the life he knew and the woman he loves slowly slip away. Increasingly unmoored, the ghost embarks on a cosmic journey through memory and history, confronting life's ineffable questions and the enormity of existence. THE GOOD - David Lowery's third film is his most ambitious and simplistic yet as he explores themes of loss, memory, time and the legacy we leave behind in a story that will not leave your consciousness anytime soon. THE BAD - Mainstream moviegoers will find the film's deliberate pacing and contemplative "show don't tell" narrative to be maddening. ​It's very tempting to call writer/director David Lowery's "A Ghost Story" a miracle movie. A contemplative meditation on the meaning or meaningless in life with the enormity of time wrapped around it, it's ambitious filmmaking which is scaled down to its bare minimum. The "story" of the ghost is a unique one that has a lot to express and a lot to dissect. It's not an easy watch for mainstream moviegoers. It's deliberately paced, forcing you to bask in the film's themes and emotional power. What happens to us after we die? We may never know but David Lowery is more than up to the task to tell his own interpretation. C (Casey Affleck) and M (Rooney Mara) are a husband and wife couple living in a small suburban house happily together. When an unexpected accident takes away C's life, M is left alone to move on with her life. However, C comes back as a ghost, choosing to not leave this world and instead confine himself to the same house he and M built a life for themselves in. As time passes, M moves on with her life but C remains in the house as other families and people move in and out, observing, waiting and hoping that some day M will return. Unable to be seen or heard, his presence is felt by all who come to the house, as time passes and the very essence of death, memory, time, and legacy are examined. As we watch "A Ghost Story," the frame is cropped on the sides, forcing us to hone in on what these people are doing and how they're living their lives. It feels like we're eavesdropping as long stretches of time pass with little to no dialogue said by Rooney Mara or any of the other actors. We see Mara eat an entire pie in one unbroken shot for minutes on end as the Ghost watches. We see the couple enjoy a tender moment in bed together in yet another single shot. Affleck, in particular, has an interesting role here as the "Ghost," where he is hidden under a white sheet, with eye holes, dark as can be, with zero dialogue and expressionless. However, it allows for us to be able to project our own thoughts, feelings, and emotions onto the character thus creating a personal connection. There is, however, one scene in the movie where a bunch of hippies are having a party in Affleck and Mara's old home and there is one monologue which is said that I cannot get out of my head. The monologue, expressed by actor Will Oldham, presents a nihilistic breakdown of the essence of mankind, the legacy we try to leave behind, and how it is all meaningless for in time we will all disintegrate into nothingness. It's truly profound and really hammers home the theme of the film. 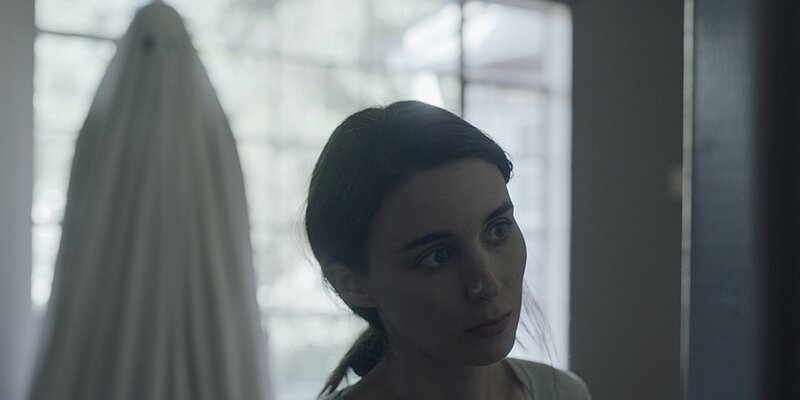 On a technical level, "A Ghost Story" is an example of bare-bones filmmaking by Lowery. After directing the CGI-Disney film "Pete's Dragon," his new film offers very little visual effects and instead uses meditative and imaginative editing to show the passage of time both quickly and slowly. The music by Daniel Hart is strange, melancholic and gorgeous in its simplicity. And the visuals are some of the most breathtaking on an ethereal level. Lowery wants to highlight a sound you could not explain which you heard in your own home or an unusual change in the shadows through light. It's all very beautifully haunting in its depiction of the supernatural and that which is possible. As Affleck walks steadily through the earth, we begin to realize that time is none of his concern anymore. Time is not valued. Time moves slower for him now. Time and its interpretation through the Ghost's eyes is why the movie works. It lingers on and develops an appreciation for the smaller details and that is paralleled with exactly what David Lowery is doing through his storytelling. While "A Ghost Story" is clearly for more mature audiences, it feels like a short bedtime story you would tell your children. It has a story that is simple in its execution but grand in its ideas. It conveys so much with so very little and will surely not leave your consciousness anytime soon.